For the third time in six holes, I found myself under 50 yards from the pin, but the greens were difficult enough that I couldn’t get up and down for birdie on any of them. Still didn’t get up and down. Moving on, it’s time for what I’ll call the signature hole on this course, one that I had seen plenty of pictures of in advance. This is number 7, a long downhill par three over one of the lakes. Also, you can see behind and to the left of this green the 16th green of the Red course. 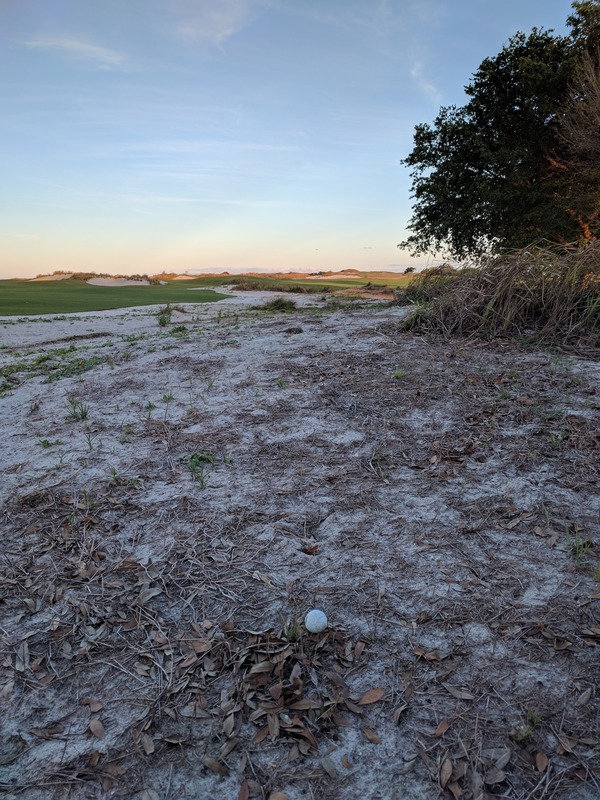 Below is the approach to the 8th hole – the drive on this hole had a super wide fairway that made the hole look like a par 5, but I realized I was wrong when I had only 150 yards in after my drive. Again, this is an awesome green with a somewhat normal look that’s still difficult to get it close. Wide fairway, tough green. Moving to number 12. It isn’t the longest hole at only 408, but the little lake shown in front of the green makes you think about what you want to hit off the tee rather than just ripping driver. In play off the tee, not on the second shot unless you chunk it like Mike did. Now I stupidly didn’t take a picture of the 13th hole, but want to make a comment about it. It’s a drivable par 4 like the 6th hole that I talked about above, but instead of being easy like the 6th, this hole is the classic difficult drivable par 4. The fairway is basically like a triangle where it’s wide when laying up, but keeps getting narrower and narrower the closer you get to the green. 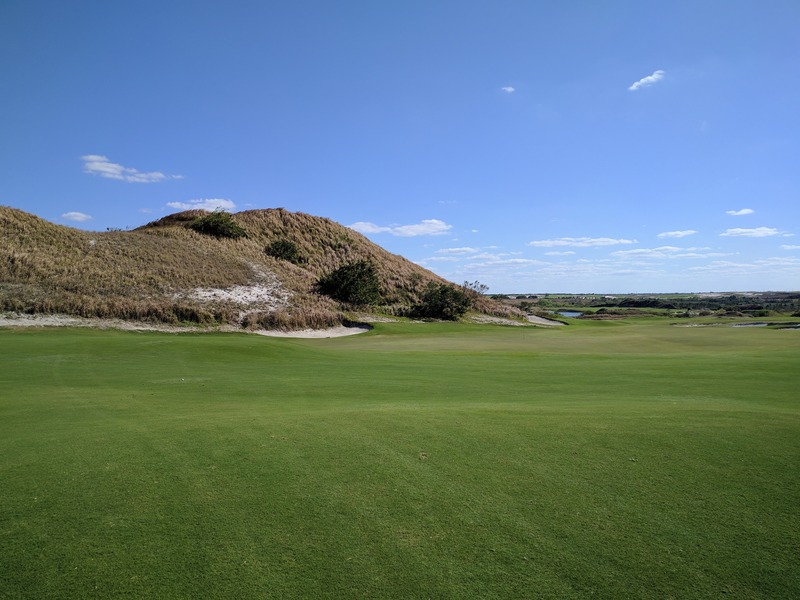 Sure you can hit driver off the tee, but it’s very tough hitting the green with a giant bunker to the left, and upper level bunkers on the right. You can only hit the green if you are able to roll your ball through a 10 yard wide gap. The green is also raised and so far away from those bunkers, making getting up and down difficult. That’s the classic drivable par 4, a hole where you need to think about playing the hole in so many different ways. Check the 15th hole here, a great example of large fairways, but needing the correct angle to get it close to the pin. This is the tee shot with Mike walking in front of me, and look at how much room there is to the left. Crazy amount. Super gorgeous this time of night. I however hit it too far to the right into the waste area, and the approach shot look is below. If you look closely at the pic, you can see the pin straight ahead. But look to the right of that and you’ll see a hill there. My angle, which is too far to the right doesn’t bring the hill into play. But if you play safe to the left fairway, that’ll be guarding the green and you’re sure to get bounces off of that thing if you don’t land the ball perfectly. When we got the 16 hole, the darkness was finally starting to come in and actually affect our ability to see our shots. 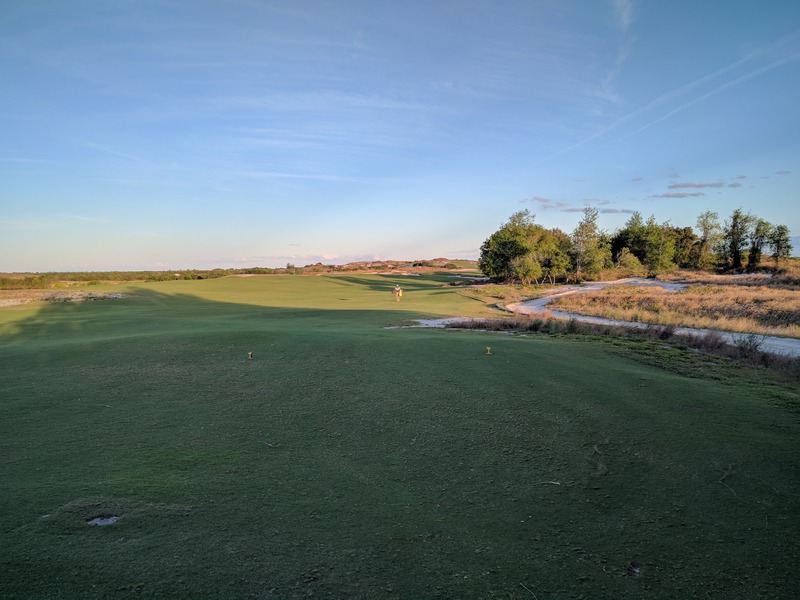 16 is a super long hole at ~240 yards, but has a large green that makes you pretty much just want to hit it near the green and get up and down, which I was able to do as a sandy. And the view while walking from the tee to the green was beautiful with the setting sun behind the green. Done with both courses at Streamsong (@streamsongresort) from today. Which one is people's favorite? We're big fans of both obviously. Best part though was being able to finish all 18 holes of our second round after teeing off late. This is the 16th hole on the Blue course, a par 3 playing 251 yards today, luckily downwind, but also straight into the setting sun. By the time we got to the par 5 17th, darkness was really coming forced us to just hit the ball and hope we could tell where it went by our swings. Same story on 18, where we whacked it and then looked in the dark. We were barely able to finish before pitch black, but considering the replay rate and having a blast out there, definitely a good idea for us to play that round. Time for the Black course review. Jklolling, the Black course isn’t open until the fall. Couldn’t play, but we were able to see a few holes from the 3rd and 4th holes of the Red course. 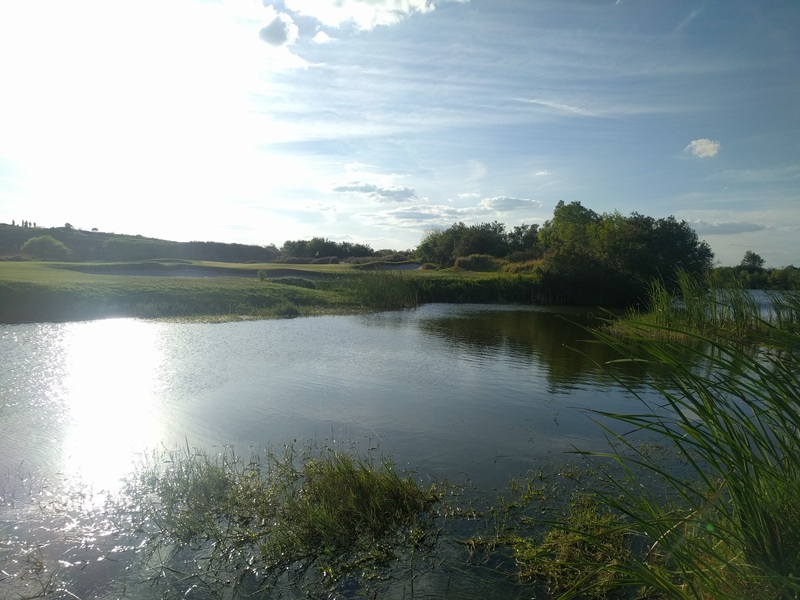 Streamsong’s website has some pics though and it definitely looks like it will be worth another trip. On the car ride back to our AirBnB, Mike and I talked a lot about the differences of the courses, which one we liked better, and which one we’d rather play if we had to pick. I wasn’t exactly sure about that answer at the time, but now having talked about all the holes and looked at all the pictures I have an answer. If I was going to play another course today, I’d pick the Red for the main reason that it’s more difficult off the tee. I love difficult courses. There’s another MacKenzie quote that says courses that are simple to move around are better than more difficult courses, which is the main difference I think between Red and Blue. But for me, I like playing the difficult courses. Back when I was playing in college, I’d play simple courses and not have the correct mindset to make birdies and shoot low scores. I was happy when I had simple pars instead of getting up and down for birdies, which is exactly what happened on three of the first six holes on the Blue course. My best tournaments came on difficult courses where my mindset was to concentrate on making pars. Besides tournaments with tough courses, I like playing tougher courses for practice. 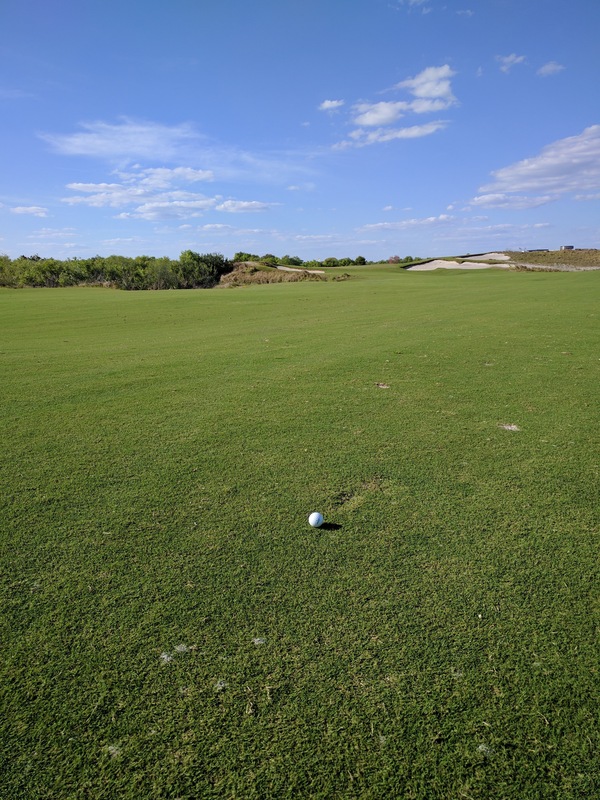 I want to have the pressure for hitting good shots as practice instead of me just trying to swing as hard as I can on the wide open holes like was the case on the Blue course. Playing tougher courses for practice makes tournament courses easier to play. Thinking back overall for the Blue course, every hole is unique and none are forgettable, but there aren’t any that I initially think are too crazy like some on the Red. On the Blue, there are no holes like the 16 at the Red that cause me to complain about how tricky the hole is. So, if I had to pick a course as the only course I could play ever again, I’d pick the Blue. 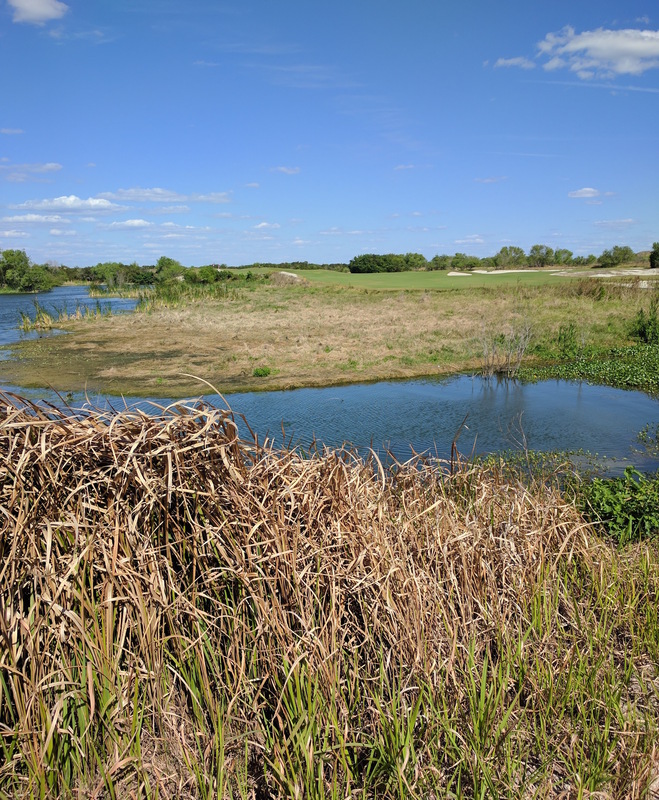 The land is pretty and similar on both the courses, but the design seems to be different enough that if you had to distinguish between the courses based on images of a hole, there’d be a 85% changes you’d get the course right. 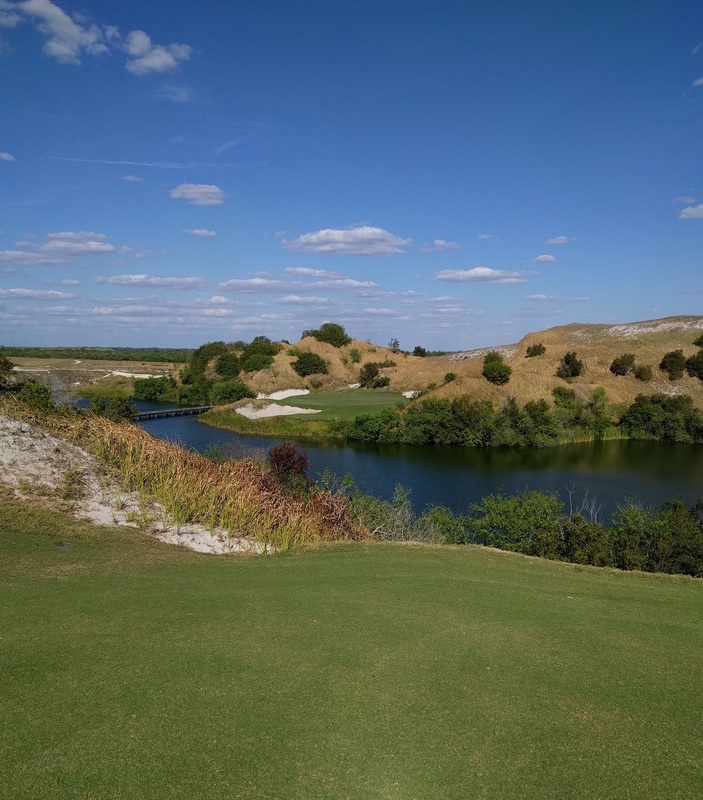 One of the greatest thing about Streamsong also is how this fall, the three courses there will be designed by the top 3 modern architects in my opinion. 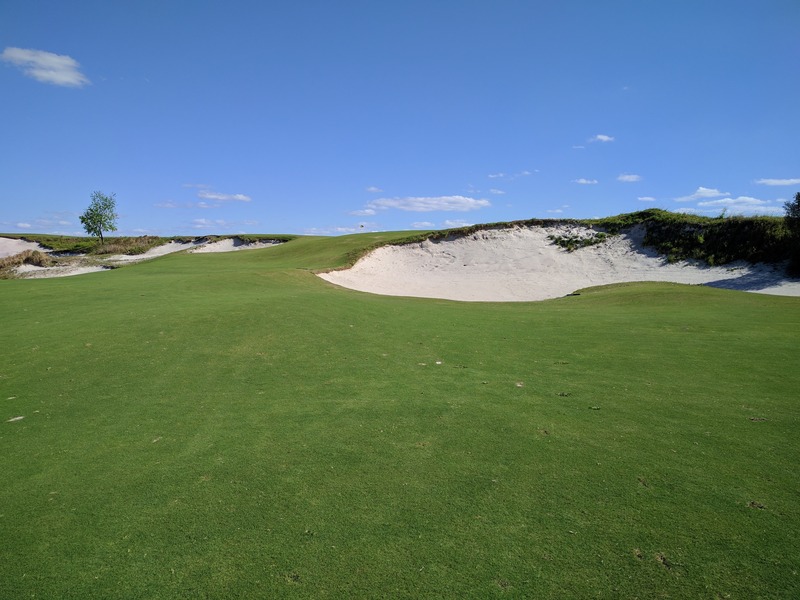 Gil Hanse is the designer for the Black course, and ever since his Olympic course in Rio was played, he definitely bumped up from the second level of designers to the top level. Being able to go to one place and play courses by each of those designers is something that everyone has to do.